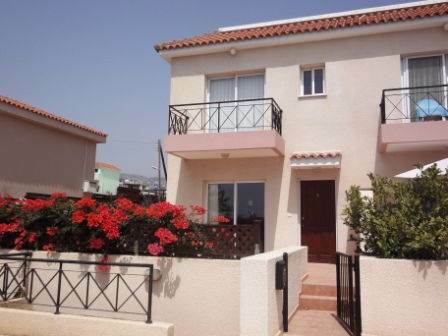 Cyprus Property Blog by Cleo : New Listing: Townhouse For Sale in Emba - Paphos, Lovely Home, Only 143,000 Euros! Emba, Paphos - This lovely end townhouse is located close to the charming village of Emba, within easy walking distance to the local village shops and amenities. Paphos and it’s many beautiful beaches are a 5 minute drive away. The property has it’s own private driveway from which steps lead down to an enclosed patio area and the front entrance to the property. The ground floor features an open plan lounge, kitchen and dining area. The kitchen is well equipped with good quality finishes including granite worktops and built-in matching dining table. There is also a guest toilet and a useful large storage cupboard under the stairs. Patio doors and a back door from the lounge lead to a terraced patio area and private walled garden with a mass of colourful shrubs. This is a lovely area for outdoor dining and relaxing. Upstairs there are two good size double bedrooms both with fitted wardrobes. The first has a good size en-suite bathroom and balcony overlooking the swimming pool. The second bedroom with en-suite shower room also has it’s own balcony. All the bathrooms including the downstairs toilet have built-in vanity units. The property is in excellent condition and has full title deeds. It is ideal as a permanent residence or holiday home.